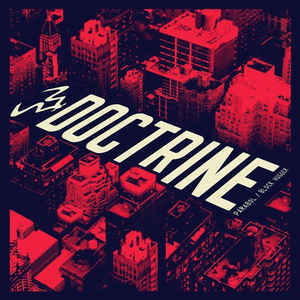 Artist Doctrine returns to the twenty-five year strong drum & bass imprint Ram Records for another double-sided single which highlights why his music was initially picked up by the label. Having built his core fan base amongst the thriving European live circuit, at festivals such as Belgian’s pivotal Rampage Festival, Doctrine came under Ram’s radar when his cross-pollination of styles gained him a notorious reputation from club to club. And after he was added to the track list of Ram’s definitive 2016 annual, the producer was offered a standalone single. ‘Panopticon’ and ‘Thunder’ introduced Doctrine to an even wider audience, where his technical prowess was picked up by label head Andy C on his exclusive Beats 1 radio show. The next offering from Doctrine once again defines his versatile musical landscape. Both tracks ‘Parabol‘ and ‘Block Hugger’ give a snapshot into what platform he’s created himself as an artist, having dived into a range of dance subgenres and pulled out the elements which translates his energy behind the decks through his music. A-side ‘Parabol’ rattles with skating percussion and explodes into life with a thumping undercurrent of bass. As one layer is added to the next, you’re driven down an almighty drop, one peddled with crashing drum loops and wobbling subs. On the reverse, ‘Block Hugger’ comes hard and fast, punching through with smashing breaks and sliced, warbling samples. ‘Block Hugger’ is a war cry for the heaviest of nights and it proves how devastating Doctrine’s cuts are on dancefloors. His forthcoming output proves his signature is becoming more refined; as a result, his name is becoming a staple on line ups across the globe with Ram’s support.